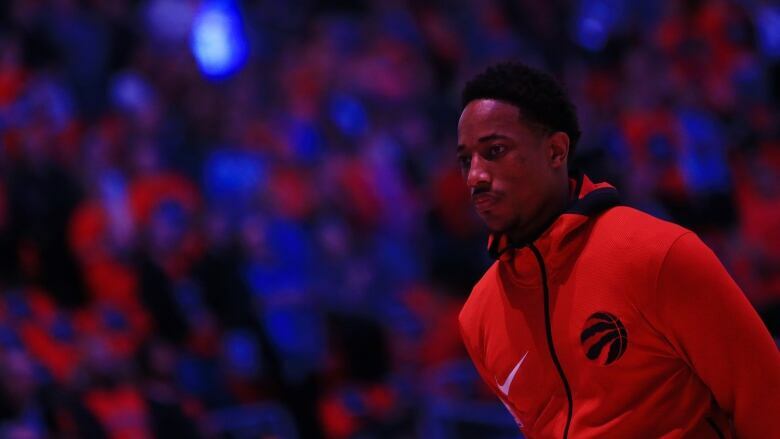 He may be an Olympic gold medallist, an NBA all-star, and the face of the Toronto Raptors, but DeMar DeRozan has never experienced anything like the outpouring of support he's received since speaking publicly about his ongoing struggle with depression. "The last week has been one of the most incredible things that I've witnessed. Period," said DeRozan on Tuesday after Toronto's 106-90 win over the Atlanta Hawks. "Me being who I am and the response and everything I got back from it, it's been so positive. "It made me feel pretty damn good." DeRozan tweeted: "This depression get the best of me." on Feb. 17 while he was in his hometown of Los Angeles for the NBA All-Star Game. That led to the normally reserved DeRozan opening up to Toronto reporters, getting into details about his issues. His words affected NBA rival Kevin Love of the Cleveland Cavaliers so much that Love called DeRozan an inspiration in an essay he wrote on his own mental health problems on Tuesday for The Players' Tribune. "It made me feel great, that was my whole intent with speaking out," said DeRozan when asked about Love's article. "I understand it's hard to step up and do a thing like that. If I had to be the sacrificial lamb to open up that gate and make everybody else feel comfortable and share their story and help the next person, that's what it's all about." Love says he was stricken with anxiety Nov. 5 during a home game against Atlanta. Love adds that he had been under family stress and hadn't been sleeping well. After briefly being winded while playing 15 minutes in the first half, he felt his heart racing and couldn't catch his breath during a timeout in the third quarter. "It's hard to describe, but everything was spinning, like my brain was trying to climb out of my head," said Love, a five-time all-star now sidelined after breaking his left hand last month, in the article. After playing against DeRozan for years, Love said he would have never guessed one of the game's best players was having problems similar to his own. Although both DeRozan and Love have competed for the United States at the Olympics and grew up in the Los Angeles area, they have never played together. However, DeRozan said on Tuesday he intends to reach out to Love.